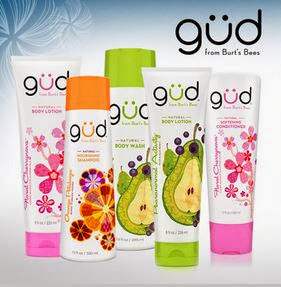 Something good for your shower - güd by Burt's Bees! güd by Burt's Bees is a fun, new natural personal care collection with delicious fragrances, real ingredients and none of the crap that you don't want on your person such as parabens, phthalates or peotrochemicals! Floral Cherrynova - cherry blossom & almond milk - flirtatious, romantic, sweet - the girl next door of fragrances with top notes of juicy bing cherries and fresh green; heart notes of rosewood and white floral bouquet and base notes of warm milk accord and creamy musk. Orange Petalooza - blood orange & hyacinth - bright, fun, feminine - what laughter smells like with top notes of blood orange, pomelo and green tea; heart notes of orange flower, rose and hyacinth; and base notes of musk and sandalwood. Pearanormal Activity - pear & acai berry - fizzy, fresh, fruity - noses everywhere are smellbound with top notes of bartlett pear, dewberry and raspberry; heart notes of rhubarb, acai accord and white flowers; and base notes of apricot and musk. I was expecting to like Orange the most due to my citrus weakness but I have to say, I'm in love with the Pear - it has a fruity and tangy scent that makes showering a pleasure! Natural Nourishing Shampoo - 350ml - $7.99 - jam-packed with botanicals for clean, shiny and gorgeous hair. Natural Softening Conditioner - 350ml - $7.99 - conditions hair naturally with moisturizing botanicals. Natural Body Wash - 295ml - $7.99 - a refreshing body wash to revive all your senses. Natural Body Lotion - 235ml - $7.99 - a delicious drink for the skin. Available now at select food, drug and mass retailers - for more info check out facebook.com/gudcanada or gudhappens.ca.